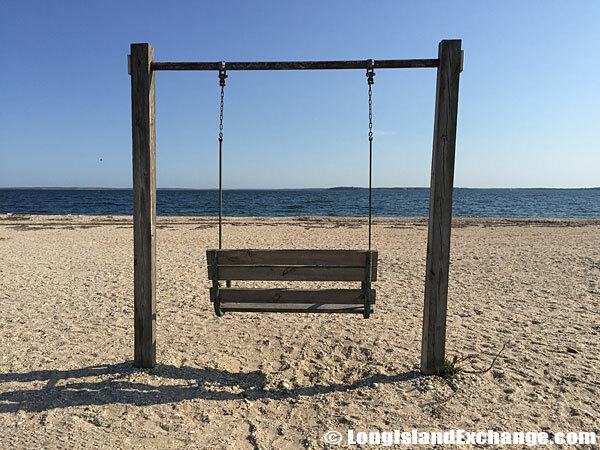 Directions: The Orient Beach State Park is located in Suffolk County in the Town of Southold, Hamlet of Orient, on the North Shore of Long Island, New York. 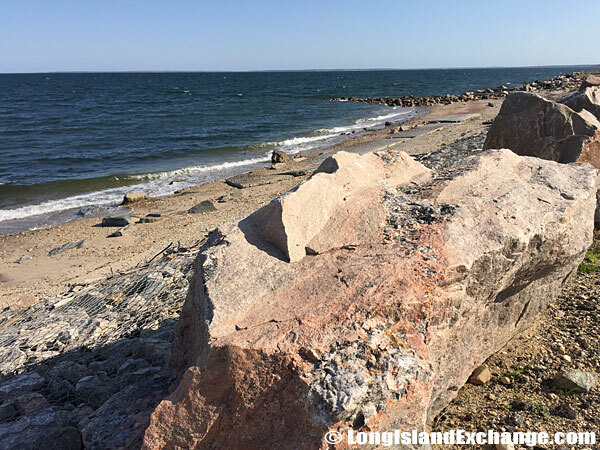 It is 118 miles from Manhattan via Long Island Expressway (Route 495) east to the end, then Route 25 east to the Park. 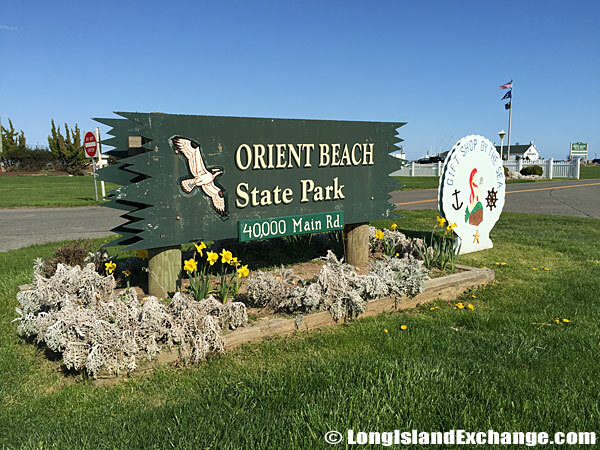 Orient Beach State Park … 40,000 Main Road (Route 25), Orient Point. 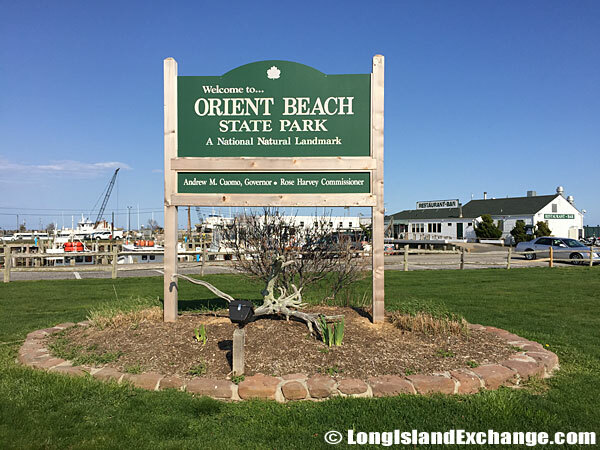 A sign welcomes visitors to Orient Beach State Park. Its natural beauty earned designation as a National Natural Landmark in 1980. 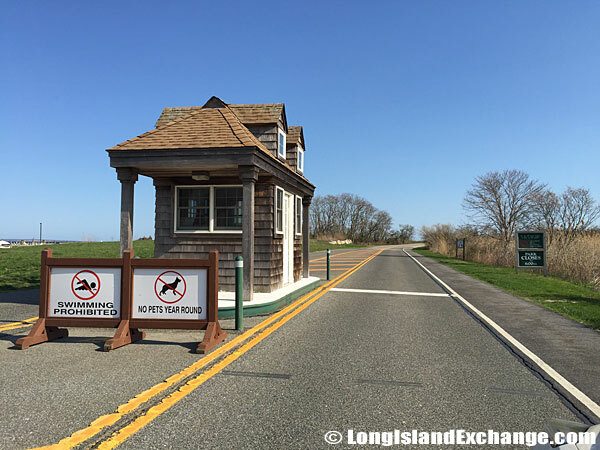 Orient Beach State Park Parking Fee Booths. 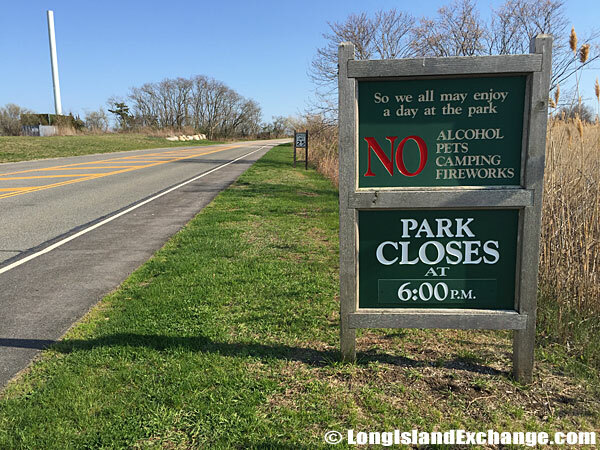 So that we all may enjoy a day at the park, there is no alcohol, pets, camping or fireworks at Orient Beach State Park. The park closes at 6:00 PM. 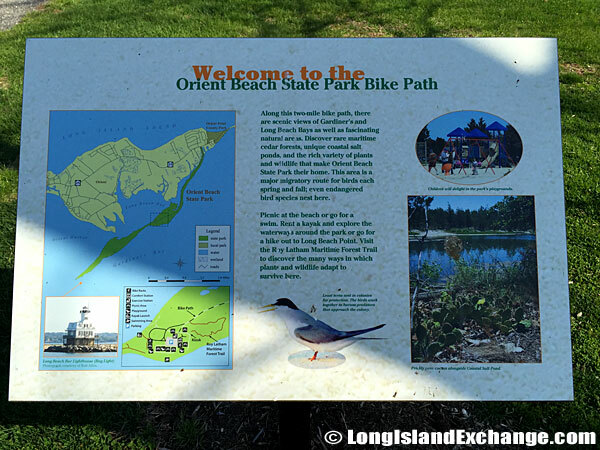 Orient Beach State Park 2 Mile Bicycle Path. 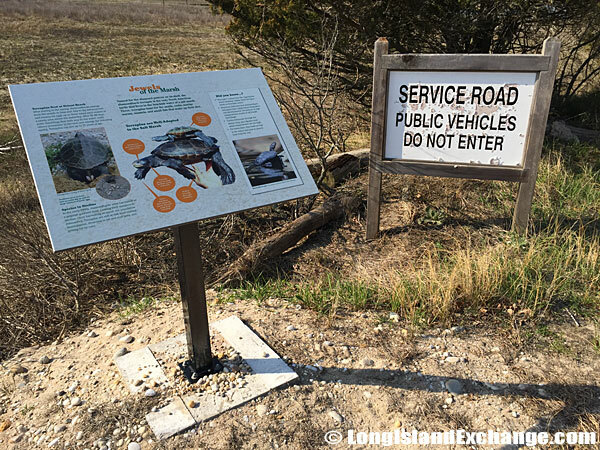 Overview: Enjoy a pleasant ride on a well-paved path providing beautiful water views and the opportunity to observe water fowl (terns and ospreys) that are plentiful in the marshes and hillocks of the area. 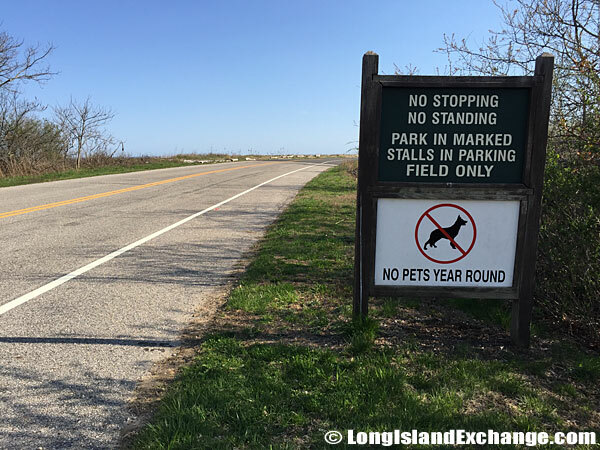 The park has 45,000 feet of frontage on Gardiner’s Bay and a rare maritime forest with red cedar, black-jack oak trees, and prickly-pear cactus. The tree cover of the Orient Beach State Park matches the bewildering array of cacti in genetic expression. There is no stopping, standing on this entrance road; except for taking this photo of coerce. Orient Beach State Park view from the entrance road. Eelgrass and scallops, the ties that bind. Orient Beach State Park view of Gardiner’s Bay. 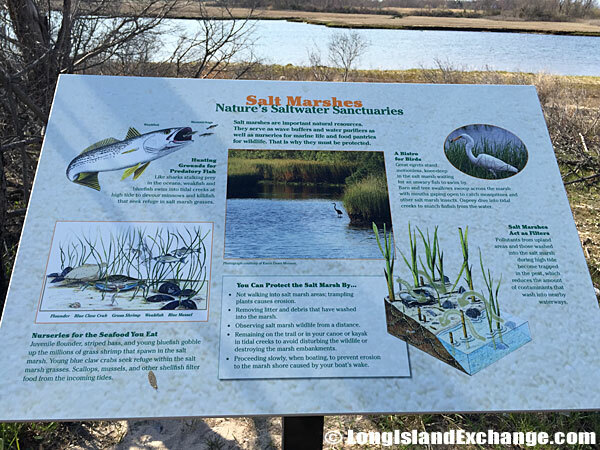 Salt marshes, nature’s saltwater sanctuaries. 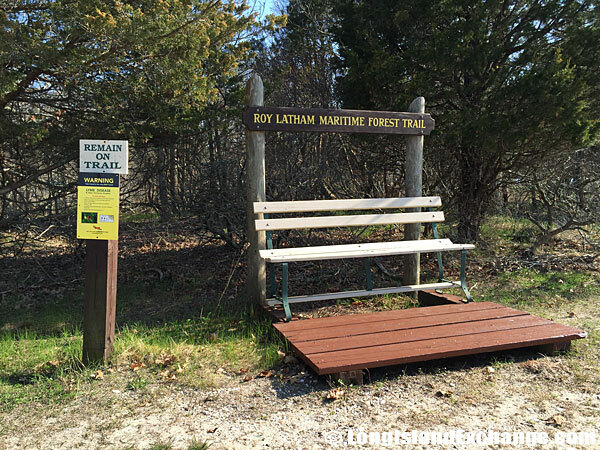 A park bench provides an ideal spot to take it all in; West side of the entrance road to Orient Beach State Park. A beautiful wood deck lets you overlook Gardiner’s Bay. 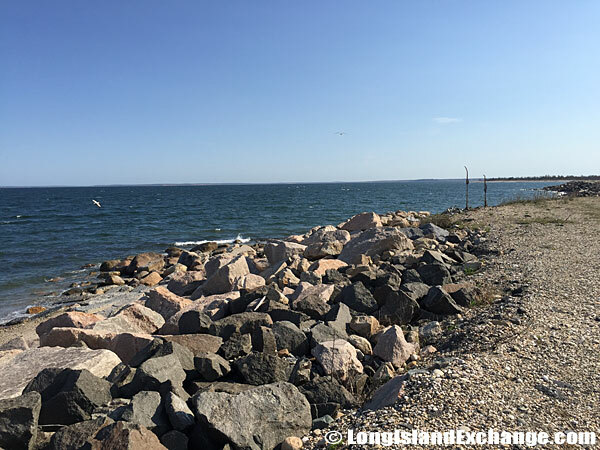 The enveloping dimensions of ocean views from Orient Beach State Park bear no resemblance to the fury for which the Atlantic is so feared, and the occasional signs of fishing and boating keep you comfortably rooted. Visitors can swim in the bay, fish, play ball, enjoy hiking, biking, picnics and walk a nature trail. There are also pavilions available for private parties with catering available by concessionaire. Orient Beach State Park along Gardiner’s Bay. 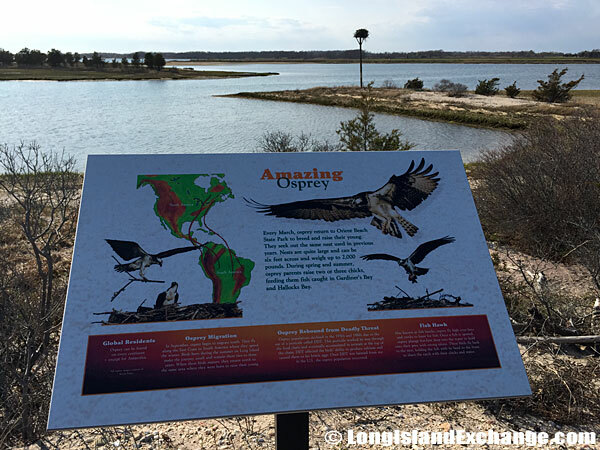 An Osprey nest stands in the background of this Osprey information sign at Orient Beach State Park. 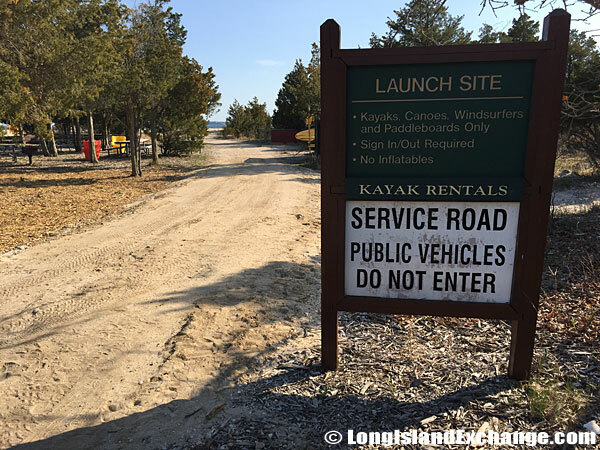 Orient Beach State Park Boat Launch Site for Kayaks, Canoes, Windsurfers and Paddleboards. Apparently, there are Kayak Rentals available in this area. 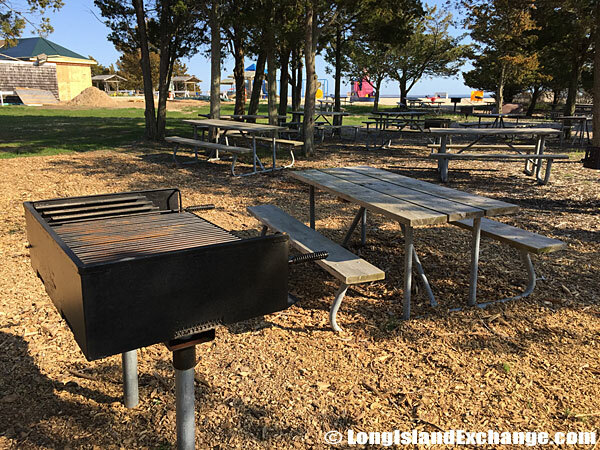 Orient Beach State Park Picnic and Barbeque area. Temperature: The Orient Beach area experiences average January temperatures above 22 degrees Fahrenheit (above -6 degrees Celsius). Summer temperatures average above 72 degrees Fahrenheit (above 22 degrees Celsius). Precipitation in the region ranges from 40 to more than 44 inches of rain and snow-melt. 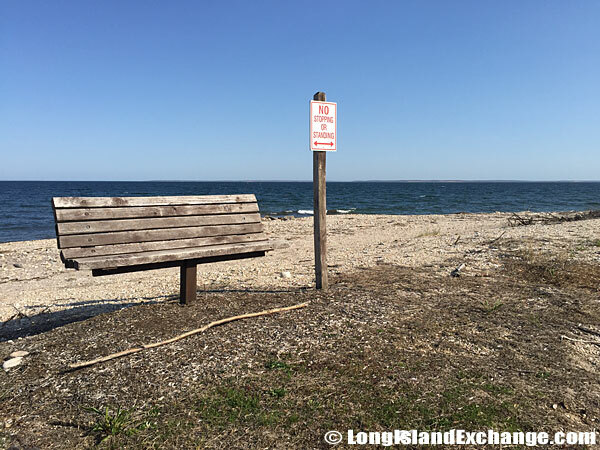 Typically Long Island has more than 200 days of frost-free growing season. 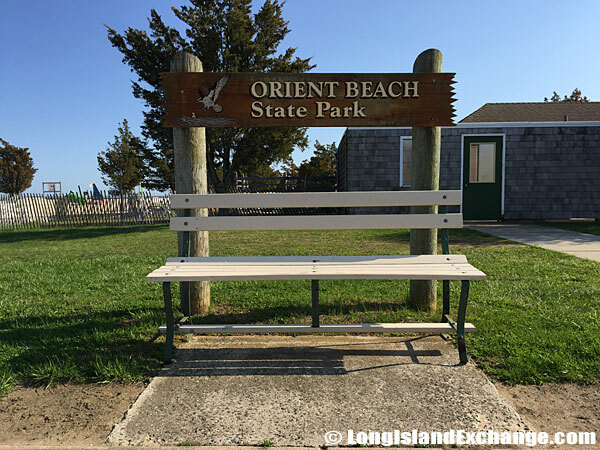 There is a large playground and play area along the beach at Orient Beach State Park. 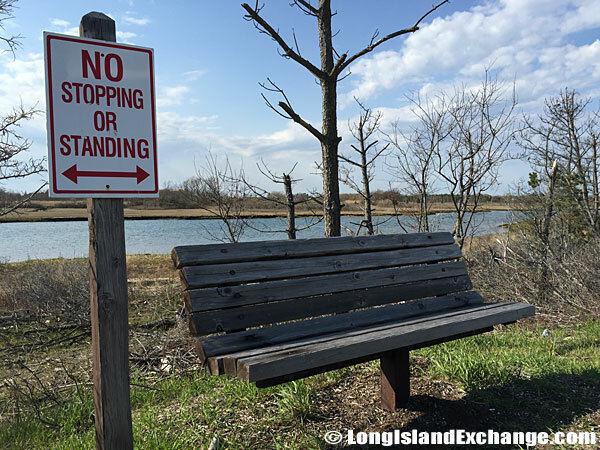 One of Several benches throughout the sandy beach area of Orient Beach State Park. 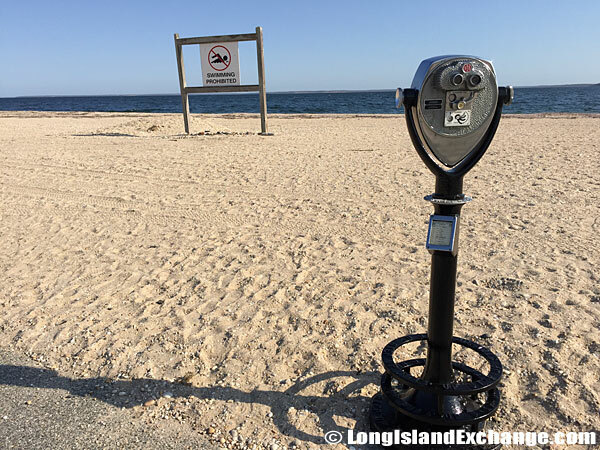 One of Several Oceanside Binoculars at Orient Beach State Park. 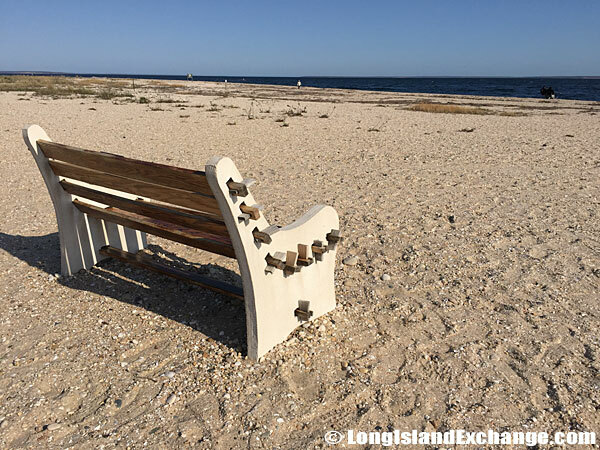 A park bench along the beach at Orient Beach State Park. 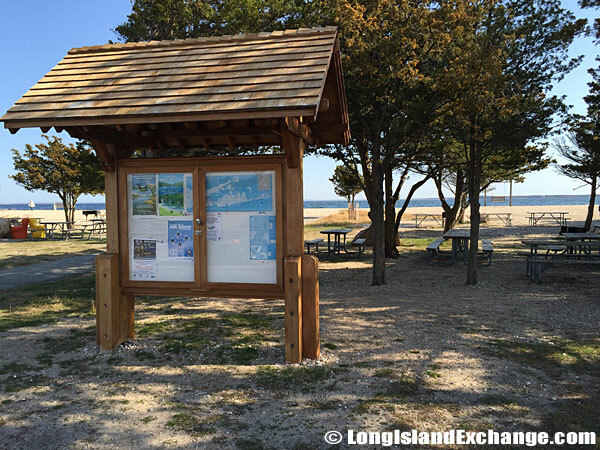 Facilities: Children’s playground, picnic areas, play fields, environmental programs, bike rentals, concession, showers, barbecue grills, 2 sand wheelchairs, pavilion (party rentals available), gazebo, hiking, Roy Latham Maritime Forest Trail, Long Beach Trail with self-guided brochures or scheduled guided tours. 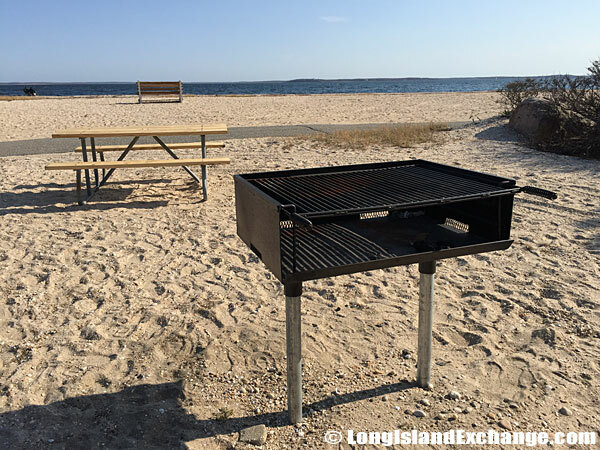 One of several barbecue spots on the beach at Orient Beach State Park. 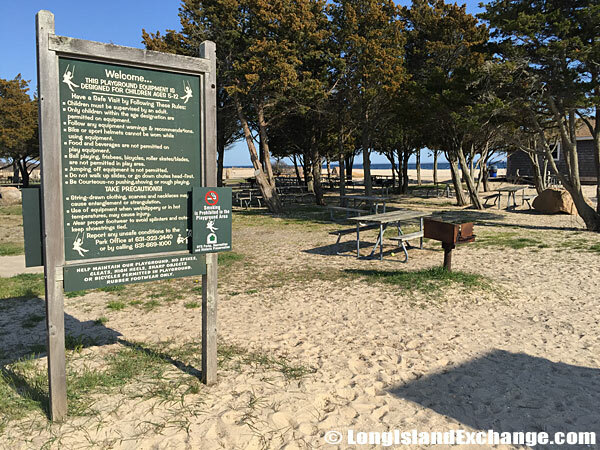 A park information sign highlights things to do at Orient Beach State Park. 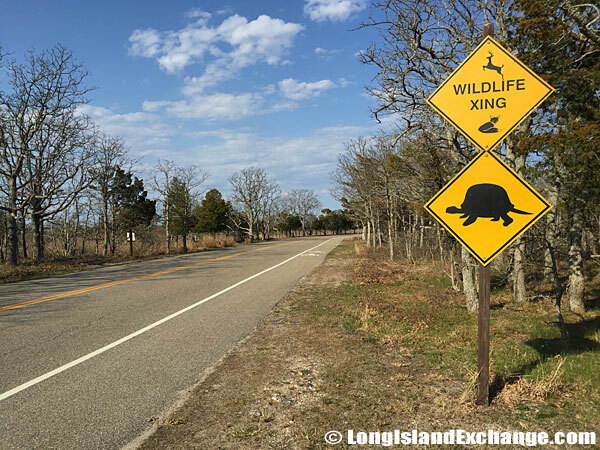 There is much wildlife in the area at Orient Beach State Park. 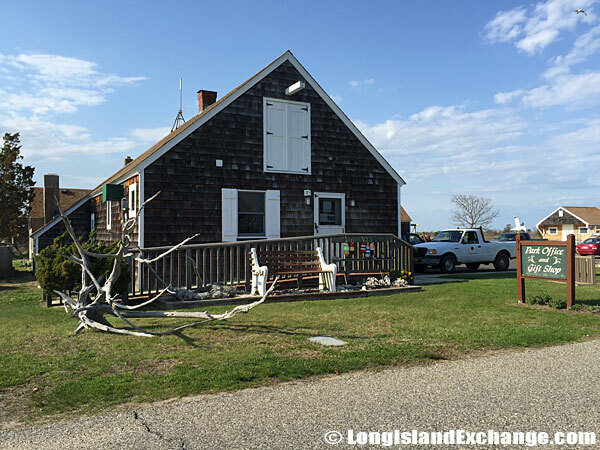 Orient Beach State Park Office and Gift Shop. 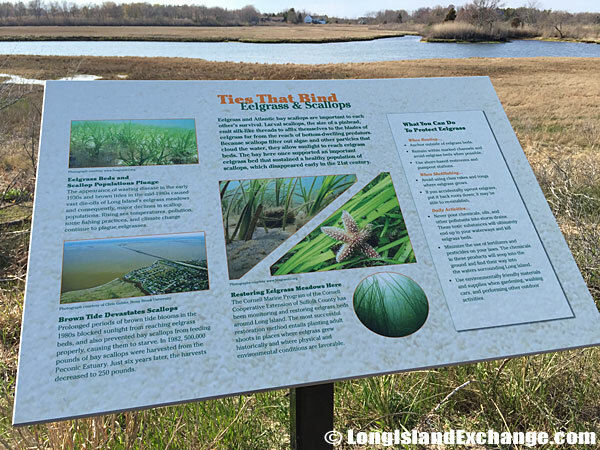 Jewels of the Marsh, a sign details the turtles living throughout the park. Seasons/Hours: Open all year, seven days a week, sunrise to sunset. Swimming season opens in late June and continues to early September. Pets: Strictly no pets allowed. Events: Children’s Summer Theatre and Holiday Tree Lighting (dates not set).